Is Obama ready for Pentagon leadership turnover? As Libya adds a third war to President Barack Obama’s growing list of foreign policy challenges, a big question is how soon a long-anticipated shakeup of U.S. defense leadership might unfold. Admiral Mike Mullen, the military’s top officer, is expected to retire after his term as chairman of the Joint Chiefs of Staff ends in September — a tight timeline for congressional confirmation that could require the White House to nominate a replacement soon. But the hardest part will be naming a successor to Robert Gates, who has announced his intention to retire as defense secretary this year. Gates, a former CIA director with enormous clout in Washington, was brought in by Republican President George W. Bush in 2006 to replace Donald Rumsfeld at the height of the Iraq war. Gates was kept on by Obama, a Democrat, in an unprecedented step, becoming one of his most influential advisers. “You have to worry about the optics of a leadership change during a time of overseas interventions. There’s always a fear of a loss of continuity,” said Darrell West of the Brookings Institute, a Washington-based think tank. The credibility Gates has with both Republicans and Democrats will be difficult for Obama to replicate, particularly as Congress second-guesses the administration on its Libya strategy. Gates has been a voice of caution about the limits of the U.S. role in Libya, even as he supports the air campaign. Other issues loom large: Afghanistan will move into the spotlight in July when the United States begins to pull out its troops, and the U.S. military is forging ahead with plans to completely withdraw from Iraq this year. Turmoil elsewhere in the Middle East plus the nuclear ambitions of Iran and North Korea also present dangers. Stephen Biddle of the Council on Foreign Relations think tank said the next defense secretary will face tremendous budget pressure, with calls for deep defense cuts that Gates has opposed. Speculation about replacements for Gates has centered on: Leon Panetta, the current CIA director; John Hamre, a former U.S. deputy secretary of defense; and Ray Mabus, the current secretary of the Navy. But many observers in Washington are unconvinced, with some still looking for a surprise pick like Hillary Clinton, despite her statements that she plans to end her career in government after serving as Obama’s secretary of state. “I don’t get a sense that there’s a clear pick at this point,” said Representative Adam Smith, the top Democrat on the Armed Services Committee in the House of Representatives. Democratic Representative Dutch Ruppersberger, also on the Armed Services Committee, said it was his opinion that everything is “on hold” for the moment because of, among other things, the conflict in Libya. “He didn’t say one thing or the other,” Ruppersberger said. U.S. officials refused to speculate on timing. Whoever Obama chooses as defense secretary will have to work closely with Mullen’s successor as chairman of the Joint Chiefs of Staff. The turnover of both posts could come very close together. “For a country that’s now involved in three wars, it’s an enormous amount of change at the top of the military and really will present a daunting challenge to the president,” said Bruce Riedel, a former CIA Middle East expert who has advised the White House in the past. 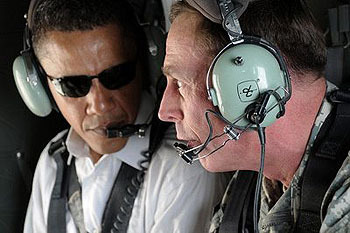 Another possibility would be for Obama to pick General David Petraeus, credited with turning around the Iraq war and picked by Obama last year to do the same in Afghanistan. But some question whether Obama would pick Petraeus, the commander of U.S. and NATO forces in Afghanistan, as one of his closest advisers. The general denies any political ambitions but there is persistent speculation he could be a potential Republican presidential candidate some day.